Heat oven to 375°F. Place mini paper baking cup in each of 36 mini muffin cups. In large bowl, stir cookie mix, water, oil and egg until soft dough forms. Stir in peanuts and peanut butter chips. Shape dough into 1-inch balls. Dip top half of each ball into sugar. Place one ball, sugar side up, into each muffin cup. Bake 8 to 10 minutes or until edges are light golden brown. 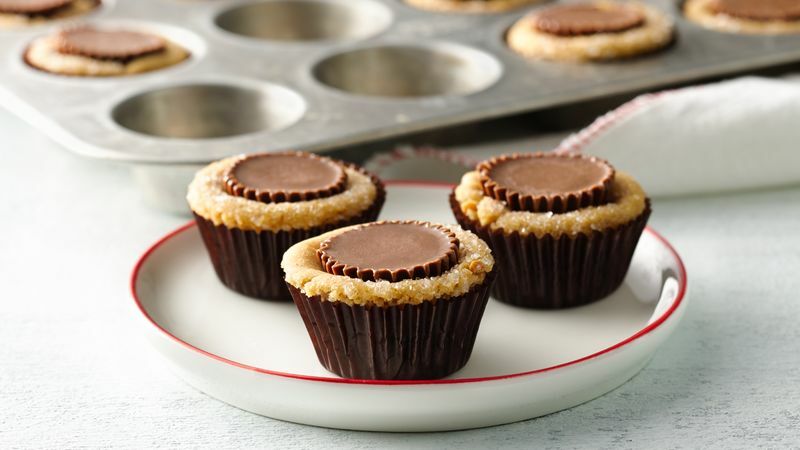 Immediately press 1 peanut butter cup into centre of each cookie. Cool in pan 5 minutes. Remove to cooling rack to cool completely. Kids can help in the kitchen by unwrapping the peanut butter cups.